To fully understand what happened on Zebes, one must look back at the events which caused the downfall of the race of birds that called it home. Amidst its fall a prophesied hope was born that, once fulfilled, changed the tide of the war against the Metroids and their pirate tamers. The cynical old bird perched upon the tall balcony of the Shrine of Prophesy. Her tall frame was surrounded by sculpted images of her race, Empresses from a long glorious past. She stood among them like a sculpted statue herself. Her chiseled beak protruded keenly beneath sharpened angry eyes, set in place like burning coals of fire. The burnished pupils took in the eternal cosmos with a calm finality. The constellation of the winged huntress pointed its talon towards a nearby yellow sun named Frru, the Chozo word for hope. Planet K2-L revolved around the star. It glimmered a mere 5 light-years away. In ancient days, her people would have seen this as a sure sign of trouble for the planet. The Chozo had worked hard in moving away from the blindness of astrology. She herself encouraged this change toward the sciences. The bird was loath to admit that, in this one occasion, such a dubious reading of the stars would be quite accurate. From K2-L’s perspective the winged huntress pointed at Zebes. War was coming to both planets whether they liked it or not. Above the huntress sat the crimson moon, shimmering its pall red light towards Zebes. A shadow extended behind the stoic bird like a thin dark blade. She pondered the light-headed Counsels who trusted too much in their religious deity, Mother Brain. Three more worlds had called in need of assistance, one of them was the human inhabited planet of K2-L. The pirates of space were getting bolder and bolder. And there she stood, the emphatic Empress of all Chozo, made into a mockery by these self-serving Counsels, forced to stand by and watch sentient beings slaughtered by the thousands. The Empress took a step towards her rival. Argrramus sat comfortably behind the ornamental dais. 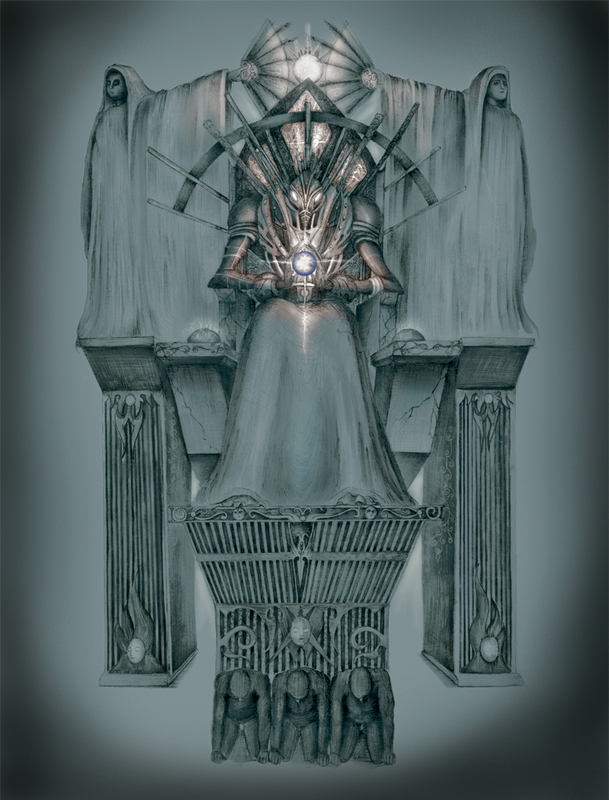 It was called the Righteous Thrown, a thrown that in times past was only inhabited by the Empress. The Empress had wanted to talk further but she had other things to attend to. He will be the death of us all, she had thought as she gave him a half bow and left for the Shrine of Prophesy. There she stood waiting for her huntress-mate Kerrfu. She had received her most trusted advisore’s message early that morning: When the crimson moon reaches its apex , meet me upon the beak of the Shrine of Prophesy. I have a most delightful present for you. The Empress had been waiting for nearly an hour. She stretched her elegant limbs, feathers bristling against the frigid air. Her amber eyes had wizened with age and did not shift like those of Argrramus. The Empress had lived one hundred and eighty-eight homeworld years, ninety of them as ruler of the Chozo Empire. She pondered her position among the councils. Many generations ago, an Empress was given power over armies and fleets of spacecrafts. The Counsels were created to handle domestic issues. The Empress was once known as the emphatic commander and chief. Her office had simply become a symbol of power, a snake that had lost its fangs. 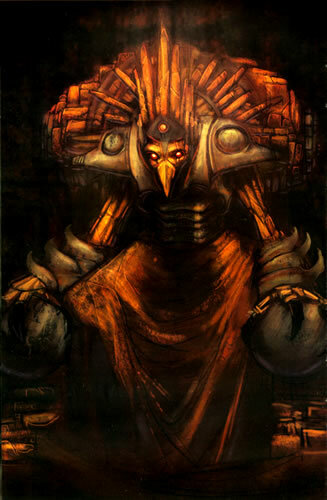 It was reasoned that the Chozo Empire had grown too vast for one person to rule. Any ideas, good or bad, were thwarted by petty arguments and personal squabbles. In short, too many people were in charge. The Chozo Empire courted their own demise like a ship flying near the event horizon of a black hole. Any one thing could tip it over. Many of the Counsels rejected one belief for another. The Emanate One was being replaced by a blind faith to some sort of Mother Brain. It was such heresies that kept them dumb to their mindless religion of pacifism. A mighty Mother Brain that makes them brainless, thought the Empress with wry frustration. She felt like the only sane one left, the only bird who stood in the way of the butcher. On top of all this, her most trusted adviser had returned from a diplomatic mission to K2-L bearing a most unusual present. Why did it have to be Kerrfu that found it? Any lesser servant and she could ignore the implications. There were too many coincidences to be ignored here though. Of all the places Kerrfu landed, it just happened to be the one city where a single human survivor was found. The Empress’ thoughts dispersed to all the possible outcomes of bringing an alien from K2-L. It was too late to ask why however. Now is the time to respond, she thought over and over like a broken computer recording. The distant flutter of wings interrupted the Empress’ thoughts. She could just make out Kerrfu’s lathe form, flying against the wind with her tender burden. Now is the time to respond. The cynical old Chozo thought again. She turned away from the sky and entered into a chamber of shadows. Minutes later, talons brushed the curtain aside. The pale red light of the moon shown inside. Kerrfu entered. The crimson moon was at once snuffed out by the curtains closing. Invisible claws scraped the floor into empty echoes. The Empress whispered a low rumbling hum. Light emitted from a nearby power orb. It illuminated a cathedral-sized room with a soft orange haze. Two monstrous shadows were cast upon a wall richly carved with prophesies. Kerrfu unfolded the burden from her robes and placed a young human child gently on the ground. Crisp blue eyes half covered with glimmering strands of blonde hair looked up at the monstrous bird. Like a stone the girl stood resolute. A talon unfolded from the Empress resting on the child’s head. The girl screamed in protest. The Empress caressed the strands of her hair until the screams suddenly stopped. Kerrfu grinned at the irony of it. The Empress detected the irony. Her probing thoughts telepathically asked what was so ironic. Kerrfu bowed five times and sang, ‘I will feed her puddings and vegetables. Someday she will eat of her own kill. Who can feed her broken soul?’ Kerrfu enshrouded the little girl in her robes and backed away from the orange light, talons scraping the stony ground. Moonlight entered, a sharp crimson knife cutting the orange haze in two. The closing of the curtains placed the moonlight back in its sheath. In the midst of genocide and terror, a seed of vengeance shale be birthed. So small he will be, and yet he shall grow into a powerful warrior. Change will be brought by him, a change that will decide the fate of all. Thus he shall be christened Newborn, sunderer that births our race anew. Only the pure of heart can wear the sentient power armor of old. Some dirt covered the rest of the stone. Even the caregivers had little respect for this place. She gently scrapped it away and read, When this day comes, the first sign will be a cynical one who professes again and again, ‘now is the time to respond’. The Empress had to read it a few more times to be sure. Was the prophesy alluding directly to her? She had never seen a Prophesy come to pass this succinctly. Perhaps this feeble child was the Newborn they had been praying for. The Empress waved such acidic thoughts away. Belief was like a double-bladed knife, one side sharpened to do, the other dulled to be lazy and do nothing. If this Earthling child was who they had been hoping for, then she would earn the right to do so. The Empress sighed at the political repercussions of it all, praying for belief’s sharper side to win the day. The last thing she needed during this coming war was apathy and laziness from her people. She looked forlornly towards the Sunborn hallway. A soft light pulsed slowly from the distance. Would they ever find someone pure of heart to wear the ancient Varia Suit? Thousands of Chozo had tried, good hunters all of them. The armor had rejected them, consumed them into itself. Would this human child be worthy to overcome were others had not? The Empress chirped twice at the power orb. It extinguished into darkness. Talons scraped upon the floor, echoing off prophetic stones that had stood for thousands of generations. Word of New Born’s coming spread all over Zebes. Many pacifists heralded her as their guardian and protector. She would be taught to fight for them so that they might keep their sacred oaths of pacifism in the coming days. The extreme believers called her the second coming of the Sunborn. They said she should be tested at once with the ancient armor. Despite the Empress’ misgivings, New Born was introduced to the Counsels. Many birds flew far and wide to see the presentation of the young girl. To the annoyance of Empress, the child’s name was rechristened to the prophetic form of Newborn. The Empress suspected it as another cult-induced choice, influenced by the blind faith to Mother Brain. Kerrfu became the child’s guardian, which gave the Empress some sway in the child’s upbringing. And so the Empress’ most trusted adviser and fellow huntress made sure the little girl was taught to read, write, and speak in Chozo as well as in Human. She was taught the basics in hunting, and how to mourn effectively for her parents. Two and a half Zebes Years passed for Newborn (nearly five Earth years). Each day began and ended with Kerrfu. The child was used to the routine. This concerned the Empress very much. A prophesied warrior should live a harder life. During the Feast of Rest, Empress took Kerrfu aside and expressed her concerns. Kerrfu bowed five times and walked away. After the Holiday was complete, Newborn was taken from her room in Kerrfu’s house and placed in a room at the Hunting School. The Chozo do not cry often, Kerrfu did so after cuddling the girl and placing her in the new bed. Newborn didn’t see her tears. She had no idea the next day would be any different. 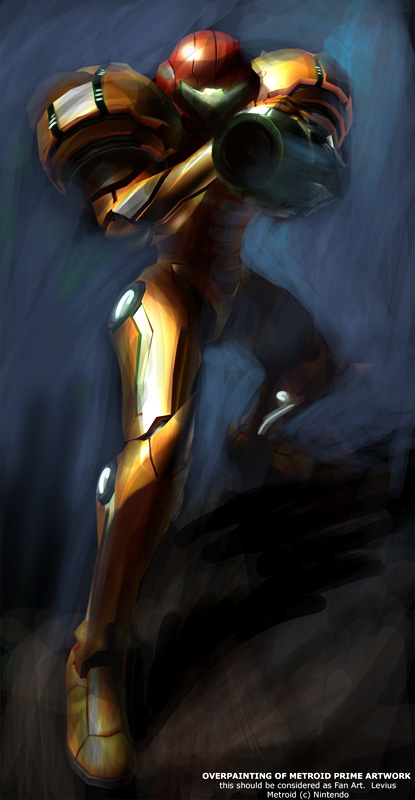 September 9, 2010 in art, Gaming, Metroid Origins, Writing. I’ll fix it right up and provide a link to his site. I have no idea how I could contact him lol.